Everybody thought that out of over one hundred synagogues in Lviv, only two of them were left: Beis Aharon V’Yisrael Synagogue and Jakob Glanzer Shul. Things changed in 2012 when one of our friends happened to discover during renovation of one of the rooms in his basement, that its ceiling is covered with polychrome decoration. 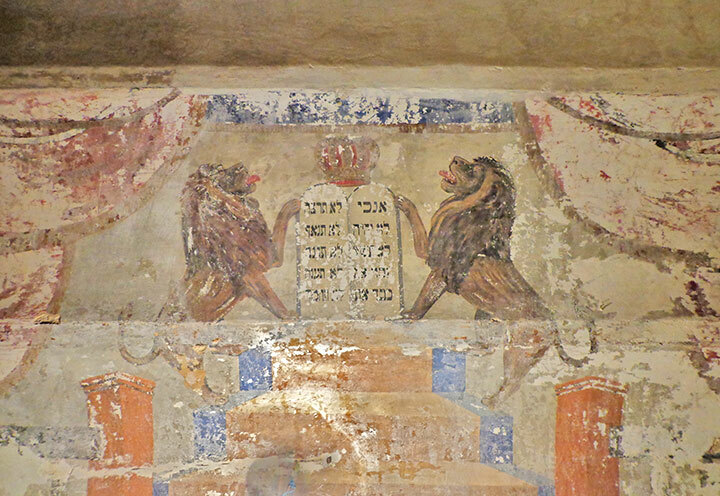 The decoration is typical for the eastern wall of East European synagogues. 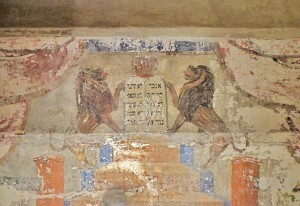 Two lions, a crown and the Tables of Stone are depicted above the Torah Ark. For us, it was clear the room had served as a prayer place for the Jewish people. But two things seemed unusual to us. 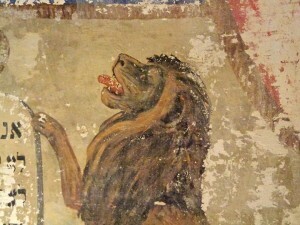 Firstly, the polychrome decoration is placed on the ceiling and not on the eastern wall. Secondly, the room itself is in the basement and has almost no natural sunlight. At first, we thought that this could have been a kind of secret prayer room from the period of World War II. The painting, however, though very simple, seems to have been too carefully done for the hard war times. Most probably this was a private house owner’s prayer room or a shtiebel for Jewish families living nearby. Perhaps they chose this basement room as a place to pray because they could not afford to rent better space on the floors above ground, or they preferred to rent rooms at street level for everyday living. The house with the prayer room in the basement is on Ivan Franko street, quite close to the city centre. It is open for guests only after personal appointment. Please contact us if you’d like to visit the room.